There’s a sense among those attending Brainfeeder at Fabric that they’re less participants in a club night than privileged witnesses of a mass movement in electronic music. It’s a feeling bolstered by the way the cast of DJs resemble a clan of twisted superheroes: the butter-wouldn’t-melt cuteness of Tokimonsta, whose rumbling dubstep shakes the galleries; nerdy-looking nice guy Nosaj Thing, whose Akai MPC box transforms him into a headbanging harbinger of bass-fuelled destruction. There’s Daedelus dressed like a Edwardian dandy; floppy haired Austrian synth wizard Dorian Concept looking like a pro snowboarder on acid; and the mighty Gaslamp Killer, who storms around the stage sweeping his Sideshow Bob curls from his eyes and screaming obscenities at the audience when he isn’t queuing up a genre-hopping slew of sonic horrors. 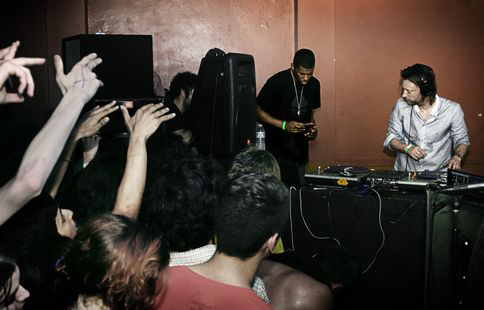 But it’s the appearance of Flying Lotus that sends the audience into its most heightened state of hysteria. After all, this is the man who became one of the most sought after remixers on the planet following the 2008 release of his formidable Los Angeles LP, and who has since worked with everyone from Kelis and Kanye to reclusive dubstep legend Burial. 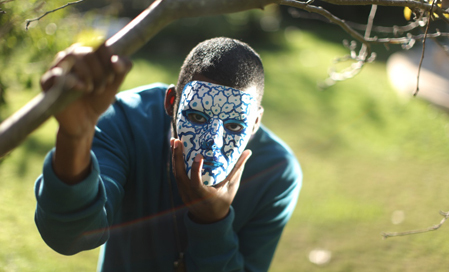 It was FlyLo who himself set up the Brainfeeder imprint, initially as an outpost for the more aggressively leftfield cuts of his progressive producer friends. And it’s FlyLo who has become a suitably unsettling figurehead for the psych revival currently decimating his LA hometown, sending kaleidoscopic shockwaves across the world and – for one night only – taking the roof of London’s favourite superclub. We meet the following day in FlyLo’s T-shirt strewn room at the London Bridge Hilton, windows open and towels stoppering doors to prevent alarms being set off by the blunts he rolls with authentic Phillies cigar skins and bitty Brixton weed (he hates the aftertaste, but likes the way it connects him with Brixton, which is the only place in London he gets “the authentic black experience”). We’re ostensibly here to talk about his new LP, the Sun Ra-channelling, interplanetary odyssey Cosmogramma, but it’s hard not to view this latest offering in the light of that same psychedelic resurgence currently turning scores of west coast kids on to DMT and LSD at raves in disused LA cinemas. All of which sounds a little like history repeating – albeit history filtered through a Roland TB-303 running in parallel with a Yamaha Tenori-On. As such, it’s increasingly difficult to stamp FlyLo with the hip hop tag you’ll most likely find his albums lumped with in mainstream record stores. While he admits that he and his friends still have that “hip hop swagger” – that it’s the genre he first got into, and the one he’s most comfortable identifying with – he’s become increasingly frustrated in recent years with hip hop’s creative limitations and refusal to expand. Perhaps more appropriate comparisons can be made with the jazz movement to which Ellison has family as well as musical ties: his aunt was the late Alice Coltrane, and his saxophonist cousin Ravi Coltrane makes an appearance on Cosmogramma alongside a roster of jazz luminaries, including bass virtuoso Thundercat, violinist Miguel Atwood-Ferguson and harpist Rebekah Raff. To which extent Cosmogramma serves as a super-condensed, 45-minute sketch of Ellison’s inner landscape – from the sweeping harps of instrumental opener Clock Catcher and the amputated synth chops of Computer Face/Pure Being, to the lilting Laura Darlington collaboration Table Tennis, which features the sound of table tennis balls dropping sequentially in the background. It is – in Ellison’s own words – the record of his dreams, a term no doubt meant to be taken literally as well as figuratively. This is a man obsessed with the idea of lucid dreaming; who recently told Rolling Stone magazine that he’d had a dream in which he and Thom Yorke had met in a bar, only to then wake and discover an email from Thom asking if he’d support him on his solo tour. Yorke and FlyLo first met after Annie Mac suggested Ellison for a remix of Radiohead’s Reckoner, and they remain pretty close. Thom was reputedly at last night’s Brainfeeder event – apparently the reason Gaslamp played Everything In Its Right Place – and himself makes an appearance on Cosmogramma, lending his mumbled musings to the haunting And The World Will Laugh With You, a track penned during the depression that followed the death of Ellison’s mother last year. Not that Cosmogramma is a consolation record in the mould of Clapton’s Tears In Heaven. Instead of wallowing in worldly despair, Ellison has chosen to free-float off into a surreal inner universe, indulging a fascination with the untapped chambers of human consciousness that is clearly more than some passing fad.